Clubhouse with bar, lounges, dining facilities, function rooms and changing rooms. Pro shop with trolley and buggy hire. A well bunkered parkland course. The prevailing wind and strategic placements for hazards make it a fair but testing challenge. Not bad. For the price worth a visit. We put up with the spiked greens so should you go soon they will be ok. Fairways and tees on the whole pretty good and the bunkers had more sand in than some I've played. The clubhouse is not bad, and reasonably priced (unless you want a diet Coke - £1.90 for a little bottle) a panini with salad and chips for less than a fiver is a good, tasty, deal. Oh, and don't worry, when you drive through a 'trailer park' - it's ok when you get to the golf course!! 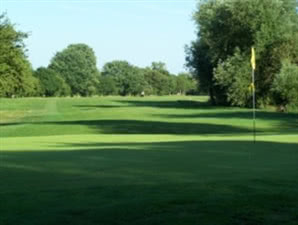 You don't expect much as you drive in through a caravan park opposite Thorpe Park but this is a cheap and cheerful course which offers enough variety and a reasonable test of golf in a relaxed, informal atmosphere. The greens had just been "done" so they were very soft and sluggish, but then they'll probably be just right for your visit. Quite a smart clubhouse inside with excellent paninis. Very nice course, with very good greens. Some of the holes are a bit tight in places but it was very quiet when we played so you hardly noticed. Nice modern clubhouse too. Played here with "TSG". Event creator is a member so we got a great guest rate of £15. Course was playing well considering it was minus 4 overnight and only +2 during the afternoon. Greens were consistant considering they were fairly hard due to the frost. Fairly open fairways although you could get stuck behind trees!! Bunkers hard but the sand was good. Water in play on two holes and some doglegs. I would recommend this course, it's worth a visit.